Okay, so it looks worse now... but hopefully not for long. I don't actually think it looks worse now. 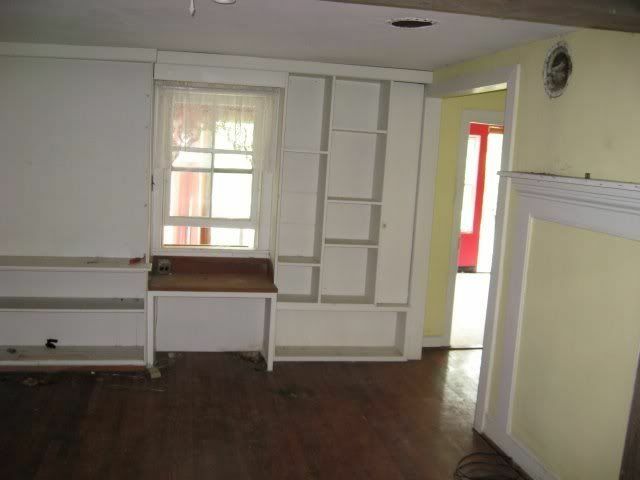 I mean, forgetting the ceiling - if you just removed the construction materials and plopped a rustic table in there, you'd be set and it's such an improvement on what you started with (that former room had no character!). Thanks! A big part of the current ugliness is the chinking between the logs -- once that is done, it will be a lot better. And yeah the ceiling... we got a few more rows done since this picture was taken, so we're on our way! Oh, your old room had character alright, and what bad character it had. You two are right on track. Will you whitewash the pine boards? Also, I don't remember the faux mantal from before. What's the deal with that? We do plan to whitewash or paint the boards. We're a little bit country, a little bit modern in these parts. Can't help ourselves. That looks like progress to me! Love it and what you all are doing to the house. it is so much better with the original log walls........you can actually see the past and the future !